Gerbils are mammals that are native to northern China. In 1954 gerbils arrived in the United States to be used in research and quickly won the hearts of lab workers who began taking them home as pets. Gerbils are about the same size as a small hamster. They weigh between 2 to 4 ounces and are about 4 1/2 inches long. The tail is as long as a gerbil’s body and is covered with fur. The hind legs are very muscular and they have large feet. Gerbils often stand on their haunches when not moving instead of crouching down. They often have a golden coat with white underbelly but gerbils can be a variety of different colors. A gerbil will usually live 3 to 3 1/2 years. Gerbils are very intelligent, entertaining animals that love to play. They are active both during the day and at night. They are very social and dependent on other gerbils to feel safe, keep warm, and for companionship. Since they are social animals, keeping them in pairs (or larger groups) is always recommended. Gerbils are easy to care for, take up very little room, and supplying a home and food is relatively inexpensive. A couple pet gerbils in your home can be very fun and enjoyable. Information on all the supplies necessary to care for your gerbil. The proper diet required to have a healthy pet. A guide to the type of home and the maintenance required to care for your gerbil. 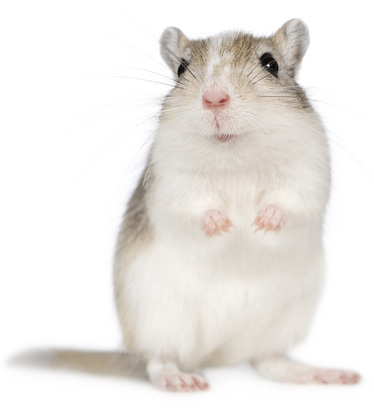 Common health problems and illnesses that could affect your pet gerbil. All about breeding, sexing, and caring for baby gerbils.